When it bothers to think of teenage girls at all, Hollywood portrays them as either the boy-hero's alluring ornament (in action movies like Transformers) or preternaturally efficient girl-women who can solve any problem (as in Juno). Both are fantasies that shed little light on the agonies and complexities faced by adolescents armed with nothing but instinct and arrogance. A refreshing alternative to those Hollywood staples is offered by two films in this year's Cannes festival, both of which examine a girl's attempts to escape a desperate family situation in a big-city slum. Fish Tank, the second film by British writer-director Andrea Arnold whose Red Road won the fesitval's Jury Prize (third place) in 2007, suggests that the effort to escape one's home, class and genetic destiny is as doomed as the dreams of a convict on death row. Lee Daniels' Precious, set in bleak 1980s Harlem, offers a bit more hope  and considerably more cinematic life. Fish Tank depicts 15-year-old Mia (the eye-catching Katie Jarvis) living with her mum (Kierston Wareing) and kid sister Tyler (Rebecca Griffiths). Expelled from school, Mia has picked up specialized language skills at home: the whole family spews endlessly obscene insults at one another, their neighbors and their dog. The girl also has two ambitions: winning a job as a hip-hop dancer, and freeing an old, gray horse chained in a neighboring trailer park  a rather obvious equine metaphor for herself. Arnold could be setting up a slum-child-makes-good scenario in the mold of Billy Elliot, but the film's grimy, unrelievedly grim aura offers little hope for storybook escape. A more attainable ideal materializes when Mum brings home a new boyfriend, Connor (Michael Fassbender, who shone at Cannes last year in the Irish film Hunger). He's very attentive to the girls, and they take to him. "I like you," mouthy Tyler tells him. "I'll shoot you last." As time, trust, and alcohol strengthen the inevitable urge, Mia and Connor engage sexually one night while Mum is passed out upstairs. Theirs is a slow dance toward a disaster, which Arnold choreographs with a natural sensuality. Mia has also befriended a boy closer to her age, Billy, who steals car parts and repairs jalopies at the local trailer park. Her two male relationships lead the film to a flash of melodrama, and to prospects for Mia that are no brighter than her mum's. From A Taste of Honey, The Loneliness of the Long-Distance Runner and other kitchen-sink dramas of the early 1960s to the films of Ken Loach and Mike Leigh, British independent cinema has taken long, increasingly harsh looks at the struggles of the young. Fish Tank is admirably, indeed unsparingly lacking in sentimentality. Its strong, blunt strokes paint a picture of a generation unable dance itself away from the edge of the socio-economic abyss. Precious, which under the title Push: Based on the Novel by Sapphire took both the Grand Jury Prize (first place) and the audience award at this year's Sundance Film Festival, begins in depths even Fish Tank can't quite plumb. 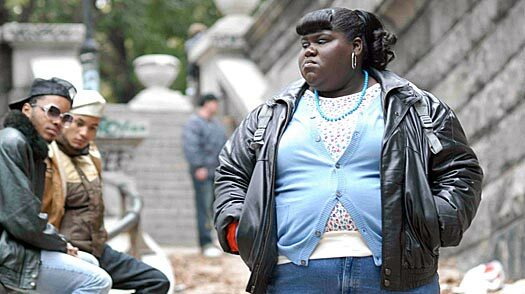 Claireece Precious Jones (Gabourey Sidibe) is an illiterate, morbidly obese 16-year-old with a wildly abusive mother (Mo'nique) and an absent father, who has just impregnated the girl for the second time; her first child  dubbed Mongo, for Mongoloid  is brain-damaged and stays with Precious' grandmother. Word of the girl's pregnancy has led to her suspension from junior high school and threatens the family's eligibility for the welfare checks that are their only support. When someone tries to tell that her things may be looking up, Precious tartly replies, "I'm lookin' up. Lookin' for a piano to fall. A desk, a TV, a couch. Mama, maybe." As Fish Tank's Mia trusts the affections of a caring male, Precious is given the chance for self-improvement by attending a school called Each One/Teach One, which tries to prepare stray students for a high school diploma exam. There she meets her guardian angel and miracle worker: the teacher Miss Rain (Paula Patton), who has a gift for bringing out the best in the misfit students in her care. Precious gets sterner help from a welfare worker (Mariah Carey) and rare male friendship from a hospital nurse (singer-composer Lenny Kravitz). In the ceaseless, calamitous storm of her young life, there's the chance for a rainbow. For in the Miss Rain, Precious has found what Mia could not: a loving mother. Sapphire (the pen name of Ramona Lofton, a poet who worked for years as a social worker and inner-city teacher) wrote her 1996 novel in the voice of poor Precious. The film script, by Geoffrey Fletcher, disposes of most of the first-person narration, allowing Sidibe's sullen face to express the girl's desperation and hope with an eloquence words couldn't touch. Though Precious was directed and written by men, the cast is dominated by women; they play the heroine, the helpers and the villain. All the actors are superb. Patton, whose beauty and empathy deserve to be showcased more often; Carey, the star chanteuse who deglamorized herself for the role of the welfare worker; and, most spectacularly, Mo'nique, the brassy stand-up comic in a rare and pulverizing dramatic role. She makes the mother a figure of domestic terror and, in her knockout final scene, ignorant pity. The awful premise may scare some audiences away, but Precious simply cannot be missed, for under its tough skin the film is an unabashedly inspirational anthem; it offers the rare ecstasy of human regeneration, and the discovery, on Harlem's mean streets, of a precious gem. Cannes 2009: Great  or the Greatest  Festival?